So you think one theme just isn’t enough, huh? Well then, how about a nice game of Theme Bingo? 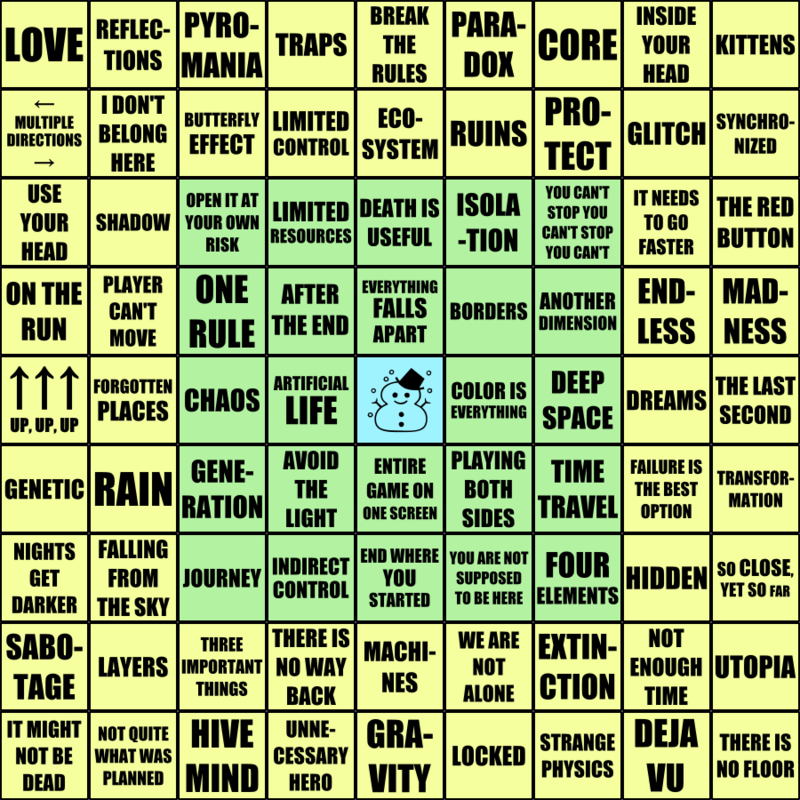 The rules are simple: when making your game for Ludum Dare, you not only execute whatever theme wins in the final round; you also somehow include the other themes from the card presented above, so that themes used overall form a row, column or diagonal from the big, 9-fields wide square. The side themes don’t need to be followed strongly; as long as they’re alluded to somewhere (and aren’t all listed in one place without any relevance to the game), it counts. If you aren’t feeling *that* confident, you might want to use only the green, 5-fields wide square instead. It can also work the other (and likely easier) way – when playing other games, you can try to spot alternate themes usages and check if they collectively form a row, column or diagonal (or a few of these). This entry was posted on Thursday, December 4th, 2014 at 3:21 am	and is filed under LD #31. You can follow any responses to this entry through the RSS 2.0 feed. You can skip to the end and leave a response. Pinging is currently not allowed. Haha! Only one Deja Vu! Yeah, there were 82 themes overall including Deja Vu duplicate, and I had only 81 fields. If there were less than 81 themes overall, I’d fill the remaining fields with Deja Vu, too.